The Garmin Zumo was first introduced over ten years ago and continues to lead the way in motorcycle GPS devices. Introduced in early 2016 is their latest entry called the Garmin Zumo 595LM. It’s somewhat similar to the year older Zumo 590LM but does have some new features especially in the area of connectivity. Like the 590LM, the Garmin Zumo 595Lm offers the ability to check your tire pressure using the Garmin Tire Pressure Monitor Sensor also known as TPMS. Garmin Zumo GPS units are made for motorcycle use. Unlike a car GPS, these are weatherproof, have glove sensitive displays are made somewhat more rugged than a car GPS unit. The Garmin Zumo 595LM provides lifetime map updates at no charge. The GPS includes Bluetooth integration so that you can hear the directions through a Bluetooth enabled helmet. The GPS also includes the ability to connect to a variety of services such as Pandora, Spotify and various rider alerts. I could write an entire article on the features and probably will, but today, we’re talking mounts. As has been typical of the higher end Garmin motorcycle GPS units, the Garmin Zumo 595LM includes a motorcycle and car mount in the box. It makes sense to use these in a car as well as a motorcycle. It’s a high-end unit and a lot of the features can be used within a car. Saves some money in that you don’t need a second GPS for your car. The car cradle has the standard 17mm socket on the back so a lot of the mounts that are available for a Garmin Nuvi car GPS will fit the car cradle for a Zumo 595LM. We continue to recommend the Arkon Suction Cup Mount for Garmin GPS Devices as a suitable replacement that’s a notch above the Garmin entry and fits the cradle real well. There’s a vacuum lock to make sure it sticks firmly. Just be sure to clean the windshield with the included wipe before use. It also includes a dash disk if you would like to use it there instead of the windshield. Garmin includes a very good RAM Mounting Kit with the Zumo 595LM. They partnered with RAM several years ago and continue the partnership with the 595LM. These attach to the back of the motorcycle cradle using the standard 4-hole AMPS pattern. Use the square metal top of the mount to line the screw holes up with the back of the cradle. There is a metal arm that supports a ball and socket system. The base has a dual mounting option. Most will use the u-bolts that comes with the mount to attach to the handlebar and these will fit bars to 1.25 inches in diameter. Some, especially those that ride Honda Goldwings as well as some Harley owners will use the brake or clutch options. The brake / clutch options will require you to remove the factory installed bolts and replace them with the bolts that are included with the mount. You may also use the spacers that are provided depending upon your model of bike. Instructions to do this are included with the mount. 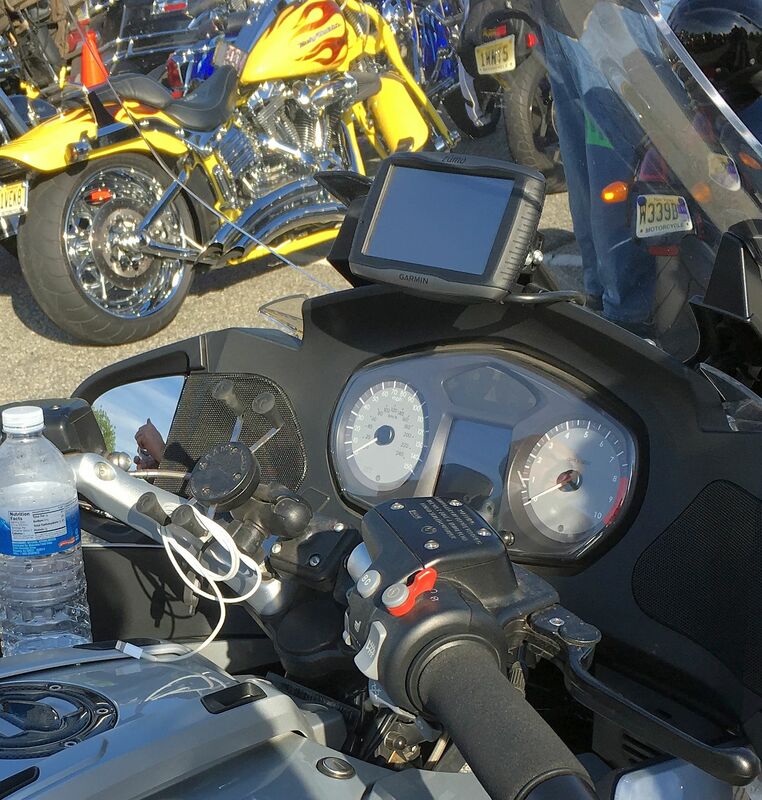 There are many other options for mounting a Garmin Zumo 595LM to a motorcycle. Another popular option is to use the RAM Fork Stem Base. This mount will attach to the stem hole on many motorcycles. The mounting kit includes a bolt and a plastic cone that you can cut to fit the stem hole. The plastic cone can be cut from 12 -20mm and 28mm or .5” – 1.10”. You can replace the handlebar base with this fork stem base. If you notice some glare once you have the Garmin Zumo 595LM mounted on your motorcycle, there are some nice inexpensive solutions available to shield your unit from glare and we recently reviewed the Glarestomper line of products which will help a lot. You can read that review here.